French startup Deepomatic just raised $1.4 million (€1.2 million) from Alven Capital and business angels, such as Pierre Valade and Jean-Charles Samuelian. The company has built a smart search engine that indexes and identifies objects in an image in order to compare them with a database of objects. Deepomatic’s first vertical is in fashion. The startup is going to partner with media organizations in order to turn their online images into clickable e-commerce links. For instance, if you really like this pair of shoes in this illustration, you can click and see the model’s name. The best part is that everything is seamless for the media organization. “Other image search engines only compare patterns and colors, and it is very disappointing,” co-founder and CPO Aloïs Brunel told me. For instance, if you are looking for a handbag and search by image on Google Images, you might get a couch that uses the same pattern. Behind the scene, the company uses fashion product aggregators, such as Shopstyle, to create a comprehensive database of fashion products. In the future, the company might plug directly to Lengow-powered e-commerce feeds. Why does Deepomatic think fashion products are a promising first vertical? Many have tried the “Shazam for fashion” approach, including Deepomatic. But the company now thinks that it isn’t the right way to tackle this market. Instead, fashion websites have been looking for alternative revenue streams all along. 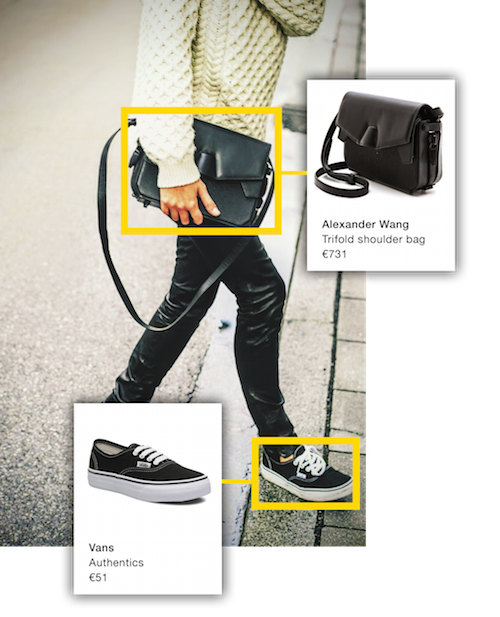 Deepomatic could become a sort of Outbrain for fashion e-commerce. With today’s funding round, the team is going to launch with a couple of media partners in Europe and the U.S. “Then we are going to explore other verticals in order to monetize more images on the web,” Marty said. For example, it could be easy to link vacation images with plane tickets and scuba diving gear. This is ambitious, but Deepomatic has the right technology provider approach with its product. If the company can prove that its search engine is seamless and better than anything out there, many partners will want to work with Deepomatic. And of course, as the search engine gets better over time thanks to deep learning, the company’s product is only going to get better.